Many golfers think there are two Sun Peaks Resort golf courses, since the front 9 and the back 9 holes are so different from each other. 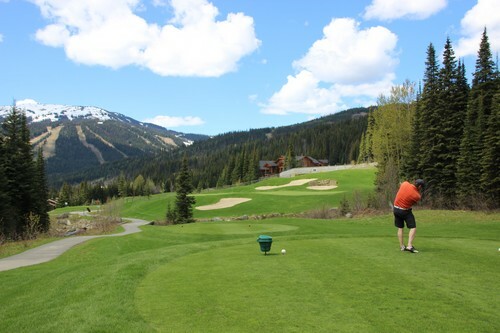 But there is only one beautiful and challenging golf course at Sun Peaks Resort, along with an open driving range where golfers attempt to drive the ball up Tod Mountain. The first thing to know is that the Sun Peaks Golf Course is the highest elevation golf course (over 1,200 meters) in British Columbia. And with thinner air, your drives travel further so prepare to be impressed with yourself and the golf course! The second thing is that the resort is called Sun Peaks for a reason, it enjoys over 2,000 hours of sun annually and is a beautiful all-season ski resort comprised of 3 mountain peaks – Mt. Tod, Sundance Mountain, and Mt. Morrisey. Hence the name Sun Peaks. But because of the elevation, it is typically a very pleasant 10 degrees cooler than at all the wonderful golf courses down in nearby Kamloops which, due to its geographic location, offers an extended golf season from mid-March to mid-October. And Sun Peaks, with the quaint world-class ski resort, beautiful scenery, large variety of very affordable accommodation at low summer rates and huge variety of other family friendly summer activities makes a great base for your Kamloops golf getaway! 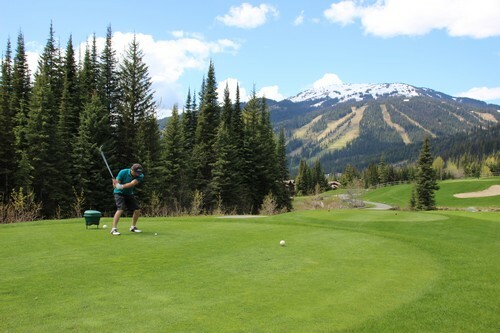 Put the first and second nine holes together, and the Sun Peaks Resort Golf Courses offer you a scenic, very interesting, fun, 18 hole, par 72, 6,400 yard Graham Cooke designed golf course at a beautiful alpine resort. 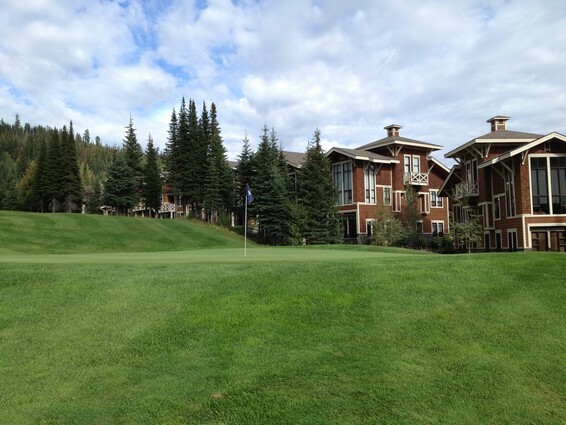 So which is the best hole at the Sun Peaks golf course? The front nine are considered to be very challenging and bringing your ‘A’ game or a lot of extra golf balls is highly recommended. Narrow fairways along the ‘up and down’ mountain valleys require accuracy to stay out of the rough and skill in not overshooting the greens while admiring the natural beauty (and occasional fox, bear, eagle, or deer that inhabit the surrounding hills). And moving on to the back nine is like moving onto the different and second of the Sun Peaks Resort Golf Courses. Here the fairways open up (although we still find some quite narrow) and you are provided with even more spectacular views. 1.) At 1,333 metres (4,353) feet above sea level, it is the highest in BC and rewards you with amazing scenery and if you’re lucky, and even more amazing drive! 2.) Our spectacular, golfer friendly, Stone’s Throw condos Best Sun Peaks rental condo and our larger Trapper's Landing Townhouse back onto the 16th green and provides for a ton of entertainment watching golfers looking for their lost balls, and then going out to collect them after the golfer gives up, drops another ball and moves on to the 17th hole! Don't forget to wave at us or our Best Sun Peaks condo guests enjoying their wonderful hot tub in our condo! Insider information: As mentioned, bring lots of extra golf balls, and be sure to bring lots of water and sunscreen. Also you might want your own other refreshments and snacks as they aren't always readily available. Ask at the Pro Shop for a complimentary Course Guide with distance and hole info. Make it a special Sun Peaks golf vacation by arranging an in-house mobile massage, high-end catered dinner party, or custom winery tour or craft brewery tour to your Sun Peaks get-away. 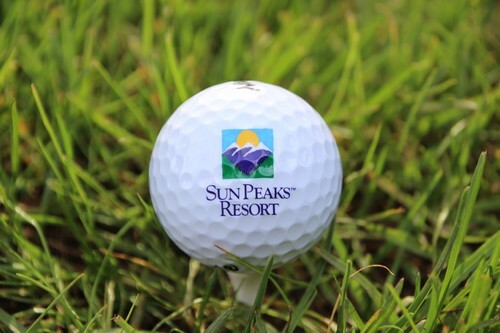 Click for more information on Sun Peaks Resort Golf Courses. Book our Best Sun Peaks Executive condo or luxurious Sun Peaks townhouse for your Kamloops and Sun Peaks Golf vacation. Kamloops golf packages, Thompson Shuswap Wine Getaways, and Sun Peaks Resort stay and play packages are available so come on up this summer Fore tons of family fun! Which was your favorite hole? Best golf course in the area?